Justin’s just graduated college, just moved to Florida…and is just out of the closet. Wade and Glen have more than just their eyes on him. Now the two sadistic Doms realize something’s happened they never expected—they’ve lost their hearts to Justin. But can they convince him they’ve changed their minds and want him for life before someone else comes in and scoops their perfect subby unicorn right out from under them? Related Books: Glen, Wade, and Justin are also featured in Disorder in the House. They also appear as minor characters in several other books. 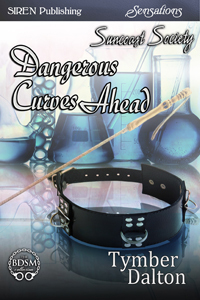 Dangerous Curves Ahead by Tymber Dalton from Sunshine Reads on Vimeo.